The champagne is flowing and so is the fun in this "delightful and sly" (Roger Ebert) romantic comedy about two people who belong together but just can't seem to tie the knot. Ushering in two Academy Award nominations, and starring Hugh Grant, Andie MacDowell and a superb ensemble cast that includes Oscar nominee Kristin Scott Thomas, Four Weddings and a Funeral is truly "a very special occasion" (Rolling Stone)! Charlie (Grant) is always the best man but never the groom. Determined to avoid even a hint of commitment, this handsome English gentleman is notoriously late to every wedding. But today he's in for a real surprise because not only did he forget the ring ... but he also just caught a glimpse of the girl of his dreams (MacDowell)! "Elegant, festive and very, very funny" (The New York Times), Four Weddings and a Funeral is engaging entertainment from beginning to end. Some movies give of an “Oscar smell”, and some don’t. 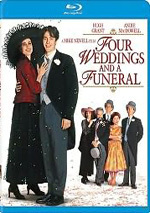 1994’s Four Weddings and a Funeral falls into the latter category, as it received a nomination for Best Picture despite its roots as a romantic comedy. It didn’t win, of course – that was the year of Forrest Gump - but it did get more Academy respect than one would anticipate. In fact, I saw the movie in 1995 solely due to its Oscar nomination. Right before the ceremony, I realized I’d viewed all four of the other Best Picture candidates, so even though I thought Weddings looked like cloying nonsense, I gave it a look. What did I think of it? I don’t know. I must not have hated it or I would’ve remembered that feeling, but I also suspect I didn’t love it, either. I guess I thought it was meh – and that this Blu-ray’s release meant it was time to give it another shot. 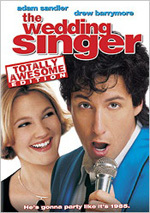 As implied by the title, the film revolves around five major life events and concentrates on Charles (Hugh Grant) and his pals as they navigate these occasions. Charles lives life as a “serial monogamist” who hops from one girlfriend to another but who can’t commit. At the movie’s first wedding, Charles meets an American named Carrie (Andie MacDowell) and immediately falls for her. They enjoy a night of passion but she soon departs for America and Charles suspects he’ll never see her again. To Charles’ initial delight, he runs into Carrie again three months later at another wedding. Alas, she comes with her fiancé Hamish (Corin Redgrave) in tow, so Charles’ hopes for a real relationship go into the toilet. However, apparently engagement doesn’t take Carrie totally off the market, so she and Charles enjoy a roll in the hay. Before long, Charles receives yet another wedding invitation – this time to Carrie’s nuptials. Will she marry Hamish and leave Charles in the dust, or will their relationship eventually develop? What do you think? That’s a sign that Weddings won’t come with too many surprises, though I don’t regard that as a serious negative. I’m fine with a plot that follows anticipated paths as long as it gives us an enjoyable ride. Which Weddings often does, and it tosses in some curveballs along the way. Though I don’t think the eventual union of Charles and Carrie seems in doubt, the track the story takes to get there keeps us reasonably off-guard along the way. We know it’ll happen, but the flick tosses in good twists and turns to take us there. Weddings is the film that “broke” Grant as a star in the US, and I can see why. 17 years later, it’s somewhat tough to distance Grant from the way his career developed – and my feeling that his performances often de-evolved into tics and mannerisms – but Weddings shows the charm that helped make him a star. As written, the film doesn’t create a very well-developed character for Charles, but Grant helps us see him as a reasonably full personality. He delivers a nice turn that allows us to remain engaged in the proceedings. The flick also boasts a nice supporting cast, and most of them provide good work. The only notable negative comes from MacDowell, as she lacks much personality. I liked MacDowell in Groundhog Day but would find it tough to locate another performance of hers that impressed me, and Weddings reminds me of her weaknesses. She tends to be flat and wooden, trends that manifest themselves here. It becomes somewhat tough to understand why Charles finds himself so smitten with Carrie because she lacks the charisma and verve that the role requires. Nonetheless, MacDowell doesn’t turn into a fatal weakness, and the movie boasts enough charm to keep us with it. Does it deliver a contrived – and borderline hokey – premise? Sure – the notion that we see the characters’ lives develop through the five titular events is so clever-clever that it borders on annoying. But it works. 17 years later, I still don’t think Weddings deserved a Best Picture nomination, and 17 years from now, I suspect I’ll have essentially forgotten it once again. But right now, I think it provides a likable, fairly engaging romantic tale. Four Weddings and a Funeral appears in an aspect ratio of approximately 1.85:1 on this Blu-Ray Disc. The film came with an erratic transfer. Sharpness was one of the up and down elements. Much of the film exhibited fairly good definition and clarity, but more than a few exceptions occurred, as quite a few shots demonstrated mild to moderate softness. The majority of the flick seemed fine, though it rarely came across as especially distinctive. I noticed no issues with jaggies or shimmering, and edge haloes failed to interfere. Print flaws were a concern, however. While the movie was never terribly dirty, it suffered from a mix of specks, marks and blotches. Though these weren’t overwhelming, they popped up pretty consistently and created distractions. Colors were another erratic component. The movie featured a natural palette, and many shots featured hues that looked warm and lovely. On other occasions, though, the tones came across as faded and flat. The good dominated, though, so the colors were usually positive. Blacks seemed reasonably dark and dense, while shadow detail appeared fairly smooth; low-light shots could be a bit thick, but not to a terrible degree. This was a frustrating presentation; it looked so good at times that the ugly shots became all the more intrusive. Expect more inconsistency from the DTS-HD MA 5.1 soundtrack of Weddings. On the positive side, the film offered a more engaging than expected soundfield. The flick didn’t offer any slambang sequences, but it used its various environments in a positive way. The weddings and receptions opened up the spectrum in an engaging way, and street scenes also gave us a good sense of place. Music added nice stereo imaging and the whole package came together in a fairly satisfying way. Unfortunately, the quality of the audio was less pleasing. Speech often seemed metallic and sibilant, which meant the lines occasionally could be a bit tough to understand. Effects had similar issues, as they showed unnatural qualities at times and didn’t provide consistently accurate representation of the elements. Some awkward foley work complicated that side of things as well. Music was more enjoyable, at least, as the score seemed pretty warm. The combination of a good soundfield with erratic audio quality left this as a “C” presentation. We get a good collection of extras here. These open with an audio commentary from director Mike Newell, producer Duncan Kenworthy, and writer/co-executive producer Richard Curtis. Recorded for the film’s tenth anniversary, ll three sit together for this running, screen-specific look at the project’s roots, cast and performances, sets and locations, music, editing and cut scenes, and the movie’s release and reception. While peppy and engaging, the commentary suffers from too much happy talk, as the participants often tell us how much they love this, that or the other thing. Still, even with all the praise, we learn a fair amount about the movie, so the track’s worth a listen. Three featurettes follow. In the Making lasts seven minutes, 45 seconds as it offers notes from Newell, Curtis, Kenworthy, and actors Hugh Grant, Andie MacDowell, and Simon Callow. We get a few production notes and some shots from the set, but this is essentially just one long promo piece, so it lacks real value. The Wedding Planners runs 29 minutes, 48 seconds and includes notes from Newell, Curtis, Kenworthy, Grant, MacDowell, Callow, and executive producer Tim Bevan. “Planners” discusses the project’s roots and development, cast, characters and performances, some aspects of the production, and the movie’s release/reception/legacy. A bit of info from the commentary repeats here, but we get a fair amount of new information. I especially like the discussion of how the movie’s success impacted its participants; that side of things delivers some intriguing thoughts. This becomes a fairly entertaining overview. Finally, Two Actors and a Director goes for five minutes, 41 seconds and features Newell, Grant, and MacDowell. We get more notes about casting and performances. It throws in a few decent remarks but is too short and fluffy to go much of anywhere. Five Deleted Scenes fill a total of four minutes, two seconds. We find “The Wedding Line” (0:29), “The Novice Priest” (1:02), “The Deaf Father” (1:17), “The Friends” (0:40) and “The Kiss” (0:34). “Friends” gives us decent – though unnecessary – exposition about Charles’ relationship with his pals, while the others tend to be minor extensions/additions. These are usually pretty good, though; I rather wish “Father” had made the final cut. We can watch these with or without commentary from Kenworthy. Actually, he adds introductions; I’m not sure why the disc calls this “commentary”, as he doesn’t chat over the scenes. In any case, he gives us some good notes about the flick, so his remarks deserve a look. Some ads finish the set. In addition to the film’s Theatrical Trailer, we get Promotional Spots. We find “Hugh Grant’s Promotional Spot” (0:35) and “Andie MacDowell’s Promotional Spot” (1:13). Actually, Grant and MacDowell appear together in both, as they deliver goofy comments from the set. They’re pretty amusing. We can also watch a quick intro from Kenworthy. He chats for one minute, 38 seconds and gives us some info about the promo spots. Kenworthy fleshes out our understanding of them. While I’ll never figure out why the Academy thought a film as slight as Four Weddings and Funeral deserved a Best Picture nomination, that doesn’t mean I don’t like the film. Thin as it may be, it offers enough charm and wit to become an engaging experience. The Blu-ray gives us a good roster of supplements but suffers from erratic – and generally mediocre – picture and audio. I do like the film but find the Blu-ray to be a bit of a disappointment, as it doesn’t present the movie as well as it should.